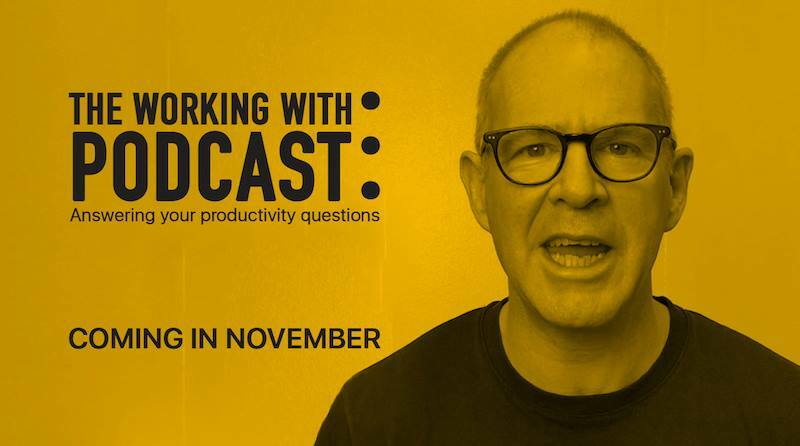 I am very excited to announce the upcoming Working With Podcast which will launch in November. This is something I have been thinking about for most of this year but I held off because I did not know if I could bring anything new to the world of productivity and self-development podcasting. Then recently, as I was ironing at home, it hit me! I could use my podcast to answer all the many questions I get every week about becoming better organised, more productive and creating a life you love living. And that ties into the very reason why I put out my YouTube videos, write weekly blog posts and send out a weekly newsletter—because I want to help as many people as I can to create a wonderful life for themselves. So, if you have any questions you would like me to answer or you have any difficulties with productivity or setting and achieving your goals, then drop me a line. You can either leave a comment on this blog post, email me directly (carl@carlpullein.com) or just DM me on either Facebook or Twitter. I will add your question to the list and will try and give you the best answer I can in the podcast. Don’t worry if you wish to remain anonymous, that is perfectly fine. Unless you specifically ask me to, I will not be broadcasting your name. All I really want to know is what difficulties you are having with productivity and self-development in general. Your question, could help many people out there to improve their lives. So, please ask me anything you like.